1,000 rounds of 9mm at $198.00 is the lowest retail price I could find online. That’s $0.19 per round of 9mm. Wolf WPA 9mm ammo is loaded with polymer coated steel cases and FMJ bullets. This ammo is ideal for training, target practice and SHTF type scenarios. The primers are Berdan style and non-corrosive. The steel cases are low carbon annealed steel and will not harm any gun barrel or chamber. The steel cases are coated with a polymer to prevent corrosion, assist in smooth feeding and easy extraction. 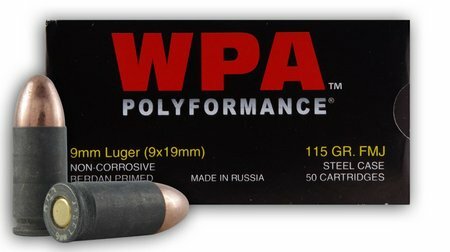 WPA ammunition is manufactured in Russia, Ukraine and Serbia in some of the largest ammunition plants in the world. It is not low quality, cheap ammo. I have shot many rounds of WPA ammo in my Glock and it has been 100% reliable. This entry was posted in 9mm by admin. Bookmark the permalink.